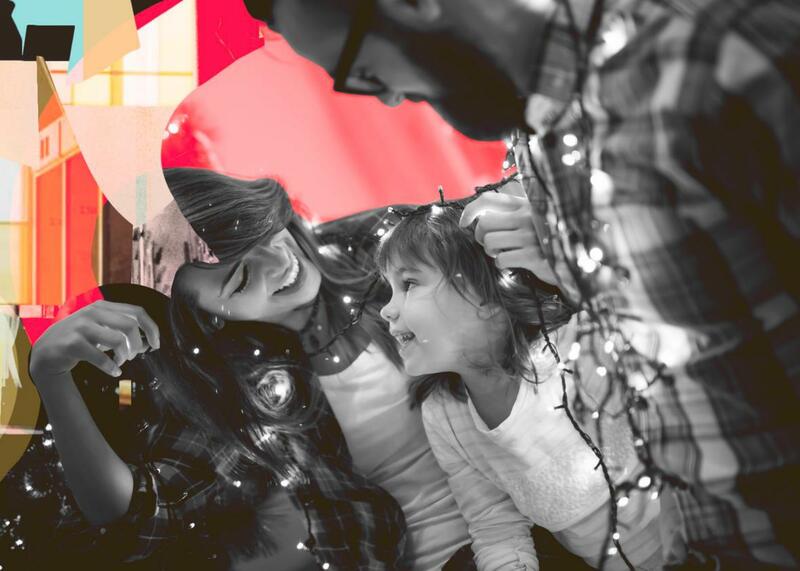 Five tips from happiness experts for more joy this holiday season. Experts Reveal What Makes for a Happier Holiday. Hint: It’s Not More Stuff. Photo illustration by Slate. Photo by vladans/Thinkstock. The holidays, it can seem, are all about time and money: Spending too much money. Never having enough time. All of which can cause so much stress and unhappiness that the American Psychological Association has actually set up an online Holiday Stress Resource Center to help us cope. It doesn’t take a survey to know that most people want to be happy and not stressed out at the holidays. We look forward to heightened feelings of happiness, love, high spirits and connectedness. But we so often get caught up in all the extra work it takes to create all that good cheer that Christmas and the winter holidays instead can come to feel like a dreaded, gigantic to-do list. Tree? Check. Lights that work? Run to the store. Cards? Ordered, stamped, and mailed. Gifts? I knew I was in need of a serious holiday attitude adjustment when my neighbor came over with a freshly baked plate of cookies. My first instinct, I’m ashamed to say, rather than gratitude for this selfless and delicious gift, was annoyance. I’d have to reciprocate, dang it. Like Santa, it was just one more thing to put on the list. So I turned to a couple of happiness experts, Elizabeth Dunn, a psychology professor at the University of British Columbia, and Ashley Whillans, an assistant professor at the Harvard Business School, who specialize in studying the choices we make around time, money, and drudge work. 1. Be in the moment: We live in an era of intense time pressure, when most people feel there simply isn’t enough time in their lives and stress is at an all-time high. That can make us feel out of control and always behind, and unhappy, especially at the holidays. So give some thought to how you really want to spend your time. Dunn makes it a practice to think about what will make the time she spends over the holidays most enjoyable and enable her to be fully present. Not surprisingly, she said, happiness research shows that when we can be present in the moment, we enjoy it more. “If you’re doing one thing and thinking about another, that undermines your ability to reap enjoyment in whatever you’re doing,” Dunn said. 2. Prioritize quality time: Guided by the research that, when it comes to happiness, time matters more than money, when Whillans took her new job at Harvard, she and her husband decided to pay more in rent so she could walk to work, rather than pay less and have a big, time-sucking commute. They consciously chose to spend more money to buy themselves more time. And as for using your time for meaningful things rather than cooking, cleaning, and all the exhausting work it can take to create holiday magic? If you can afford it, buy your way out of the drudge work you dread, they said. If you can’t, share the load, or do less of it. Dunn and Whillans recently published research that found that people are happier when they use money to buy their way out of drudgery. In one of their studies, they gave people $40 and had one group buy stuff, and another group buy their way out of unenjoyable chores with cleaning, lawn or errand services, or take-out food. That opened up the possibility of spending time differently. People reported feeling more in control of their time, Whillans said, and less overwhelmed by their daily lives. So taking a page from their own research, Dunn, who doesn’t love wrapping presents, prioritizes shopping at stores that do the wrapping for her, even if it costs a bit more. 3. Buy experiences, not things: Other happiness researchers have found that spending money on positive experiences, rather than stuff, makes us happier and increases our sense of well-being. And, Whillans said, both the anticipation of the experience and savoring the memory of it afterward can extend those feelings of happiness. In their study, people who bought their way out of drudge work and had more time, tended to choose to spend it with family and friends and socialized more and enjoyed their time more. That certainly reinforces research that found people who focus on family and spirituality at the holidays are happier than those who are wrapped up in spending money and getting gifts. And maybe find time to do a little something nice for your cookie-baking neighbor, not because it’s just one more thing to cross off your to-do list, or because the research shows doing something nice for someone else really does make us happy, but because this is what a truly joyful holiday season is all about.